An ex-medical volunteer, Anne Gleason, has recently returned to work on one of the 100 Projects for Peace in Sri Lanka. 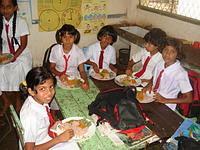 Anne took part in a medical project in 2005 and fell in love with the Sri Lankan people and their way of life. She was incredibly struck by the high rates of malnutrition within the community so this summer she decided to do something about it! Anne comments that, ‘based on the premise that all Sri Lankans have a right to both healthy bodies and healthy communities; the curry kitchen takes a multi-faceted approach to promoting peace. The Curry Kitchen aims to 1) improve community solidarity, 2) reduce food insecurity, and 3) promote health education’. With the help of Projects Abroad staff and Kalutara District Ministry of Health authorities, a small village in Niggaha has been selected as the location to start the project. The Kalutara district is home to many poor families, many of whom are unable to provide a substantial meal for their children at lunchtime. The basic principle of the curry kitchen is to provide a nutritious lunch made from local produce approved by the Public Health Inspector. The Curry Kitchen requires full community participation and aims at targeting health education goals, with parents, siblings, neighbors being invited for lunch once a month to discuss health topics and related issues. Projects Abroad volunteers will be helping on the project, including painting, gardening, English tutoring and basic first aid advice. A few days after the project opened, Anne concludes: ‘the children have all gone home with full stomachs and bright smiles, which I consider a great success, and I look forward to the bright future of this project’.